A while ago Suntran, the local bus company in Tucson, started offering real time bus locations and arrival times on their website. I thought it would be great if there was some way to figure out where you were located and then find the closest bus stop to you. With the route info and stop info, you can then be passed off to the appropriate page on suntran's site to see when the next bus will be to that stop. I developed a simple web based tool to accomplish this. 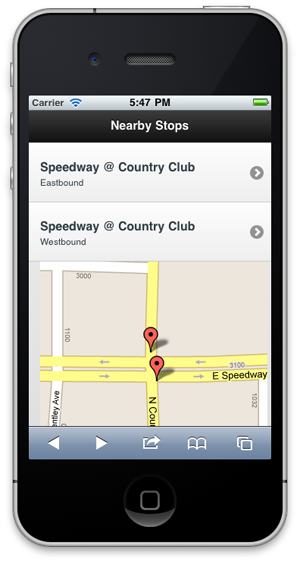 For this proof of concept, only a few stops along Speedway have been mapped. East and Westbound stops are available between Euclid and Country Club. Your current position is obtained using the location features available in mobile WebKit based browsers. The closest bus stops are shown in a mobile optimized format.